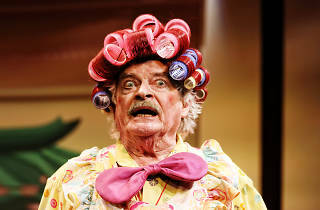 Reg Livermore cavorted onstage to steady, growing waves of audience applause during opening night of The Widow Unplugged, his self-written one-man show at the Ensemble Theatre, of which he is a founding member. It was the entrance of a much-loved star coming home. Livermore is a decades-long mainstay in commercial musical theatre. 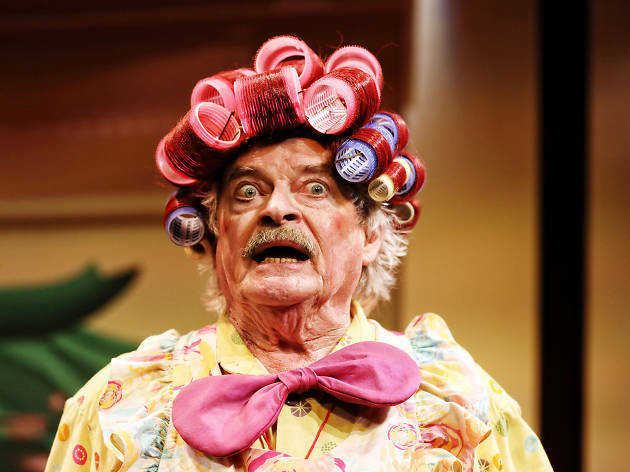 He’s starred in everything from the revolutionary first local productions of Hair and Jesus Christ Superstar, and was the original Frank N Furter in The Rocky Horror Show. He was last seen across the country in Julie Andrews’ production of My Fair Lady. He is the recipient of the JC Williamson Centenary Medal for Lifetime Achievement 2017, and has won stacks of awards during his long and successful career. But in The Widow Unplugged, he’s playing a jobbing actor with a vastly different legacy. He’s Arthur Kwick, whose award-winning performance in an Aladdin panto many years ago was the toast of the town. But when critics shut down his next comedy (they didn’t think it was funny), he never really worked again. He drifted until, sick and sleeping on a park bench, he ends up applying for work as a janitor in a retirement village. When his famous friends cancel their entertainment booking at the home (Marina Prior only does paid work, it turns out), Arthur must step in and save the day. How? By reprising his old panto character, Aladdin’s mother Widow Twankey, who is Chinese, as is the orientalist pantomime custom, and running a laundry in Mosman. The first act has a few pratfalls and some fun with garbled language as we meet and get to know Arthur; it plods along with generous chuckles. But it ends with Livermore brandishing a fan, drawling a stereotypical phrase used to mock Chinese speech, and then the lights go out. Any hope that we’ve seen the end of that vein of humour is dashed when we return for the second act: now, paper lanterns ring the stage. What follows is at best a well intentioned attempt to lampoon old performance racism and at worst a mindlessly offensive indulgence in harmful stereotypes and tasteless jokes. Using the name of Chinese food dishes while self-flagellating with human hair? Check. Fake Confucius platitudes? Check. Jokes about MSG? Check. References to eating dogs? Check. It’s very uncomfortable. It’s hard to parse the goal of this extended comic sequence. Livermore is good at broad characters, but why this one? If it’s to poke fun at ‘PC Culture’, it doesn’t work; the jokes are never turned on their heads or commented on in any way. If it is, as the broadsides against Australian immigration policy may suggest, a form of parody, it’s not sophisticated enough to tear down the racist jokes it deploys. Instead it seems to revel in them. Mark Kilmurry’s production gives Livermore, for better or worse, full reign of the stage. Livermore still has solid acting and comedy chops, and his timing is strong, even with this light touch direction. But there’s no framework to suggest Arthur’s performance is anything but a treat for us, and as a result this work feels stubbornly out of time and inconsiderate to its audience. It’s difficult to watch.